McGuire's Musings: Were we wrong about Herm Edwards? McGuire’s Musings: Were we wrong about Herm Edwards? 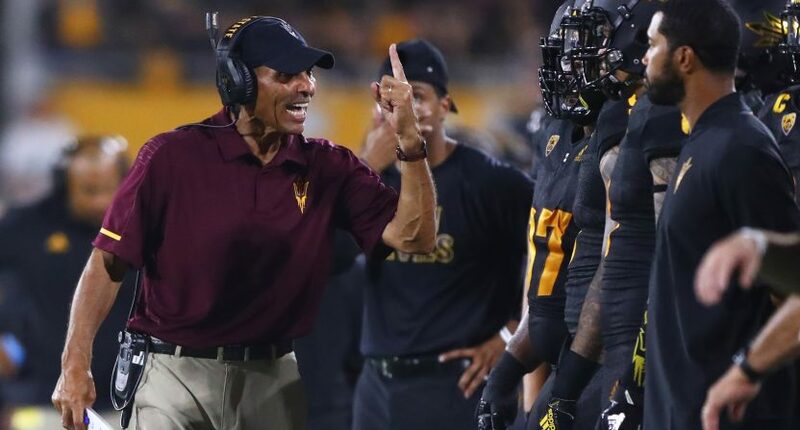 Herm Edwards has the Arizona State Sun Devils at 2-0 after upsetting No. 15 Michigan State. Oh, you thought Week 2 would be a dud? Not quite. Sure, Georgia put to rest any doubts they might be upset on the road against South Carolina, and Oklahoma and Ohio State had some easy games to play, and Alabama is Alabama. But there were plenty of things to keep you entertained around college football all day on Saturday. Why not start with a coach who plays to win the game as we sort through some thougths form around Week 2? It’s only been two games for Herm Edwards at Arizona State, but life is good for the veteran head coach in his return to the sidelines. Honestly, I didn’t see that happening, but after Arizona State knocked off Michigan State late Saturday night with a game-winning field goal as time expired, I’m more than ready to suggest I was quick to dismiss Edwards and I feel bad about doing so. Edwards actually showed off some good clock management at the end of the game to come out on top of a head-to-head matchup with the stoic Mark Dantonio. And to add on to that, Edwards is now with a win against a top-15 team while other new Pac-12 South coaches Chip Kelly and Kevin Sumlin are 0-2 after some brutal Week 2 performances on the road. How long will these good times last for Arizona State? I don’t know yet, but it’s hard not to like what we’ve seen out of the Sun Devils early on. On a day that saw some struggles throughout the ACC, Clemson wasn’t able to avoid being put to the test. On the road in College Station against Texas A&M, the Tigers had to fight to the final second to get out of Texas with a win against Jimbo Fisher’s new program. Clemson had to come up with a stop on a two-point conversion attempt to hold their lead against the Aggies after this remarkable effort for a touchdown late in the game. Credit Texas A&M for digging deep to put together a strong showing in the fourth quarter. The Aggies outscored Clemson in the fourth quarter, 13-0, but it was too little, too late. And a controversial replay over one of the stupidest rules in football didn’t help Texas A&M out either. A fumble out of the end zone (which may not have actually gone out of the end zone) thwarted a scoring threat for Texas A&M, otherwise Clemson may very well have been going home with a loss. What we learned from this one was Clemson is still a really good team, and Kelly Bryant is probably still going to be the quarterback for them moving forward. And now that they have survived the road test at Texas A&M, they can focus on trying to cruise their way to a fourth-straight ACC title. Meanwhile, Fisher’s Aggies earned some national respect and will hope to grow from this setback to become a viable threat in the SEC West. We’ve been burned by September Texas A&M before too many times, but we’ll see if this ends up being any different. After opening the seasons with losses, both Florida State and Texas got a chance to breathe a sigh of relief after grabbing wins in Week 2. Each had to battle for it too. Florida State didn’t hold a lead at home against Samford (SAMFORD) until after midnight on the east coast before managing to rally for a 36-26 victory. Texas had a 21-0 lead on Tulsa at home before needing a fourth touchdown in the fourth quarter for the breathing room to escape with a win. Needless to say, Tom Herman and Willie Taggart are off to less-than-inspiring starts this season. At least Taggart has the excuse of taking over a new program and having to do some cleaning up around the place, but Herman has already been working at Texas and he’s already come under fire for the lack of progress Texas was expected by many to be taking. I would suggest Week 3 will be important for each coach. Herman and Texas welcome USC to Austin, with both programs sitting at 1-1. Taggart takes Florida State on the road for the first time against an explosive Syracuse offense that could do some damage against the Noles. The last time Kansas won a road game, Nick Saban hadn’t won a single national championship at Alabama yet. But that streak came to an end on Saturday afternoon with authority by way of a 31-7 victory over Central Michigan. That had to feel good for the Jayhawks, who took a home loss last week against Nicholls State. It was the first road win for Kansas since the 2009 season. It had been 46 straight losses for Kansas away from home. If they didn’t win this one, it may have been at least another year before Kansas could win a game on the road again. Next up is a chance to do something Kansas has not done since 2011, which is to win back-to-back games. Kansas will host Rutgers next week. The Scarlet Knights are coming off a bruising loss at Ohio State. This one may not be for the faint of heart. Also, isn’t it cool that Kansas snaps their road losing streak on the same day Kentucky broke their 31-game losing streak against Florida? Was James Franklin just coaching to the last whistle or running it up? A year ago, Penn State head coach James Franklin caught some criticism for choosing to call a timeout to freeze Georgia State’s kicker late in the game with the Nittany Lions comfortably ahead. Asked about why he chose to freeze kicker in a game that was all but decided, Franklin suggested he was doing everything he could to coach his team and preserve a strong defensive effort for a shutout. That did rub many the wrong way. Fast-forward to last night in Pittsburgh, and Franklin served up a whole plate of reasons for those same criticisms to be fired back up. Franklin kept Trace McSorley in a blowout game with Penn State comfortably up in the fourth quarter, then had backup quarterback Sean Clifford throw deep for a touchdown, and closed out the game by challenging a fumble play with a minute to go and Penn State up 51-6. Sean Clifford replaces Trace McSorley at quarterback for Penn State and promptly throws a 34-yard touchdown to put his team up 51-6 with four minutes left. James Franklin is basically coaching with double middle fingers up at this point. But this wasn’t a rivalry game, right? Who knows if Franklin goes that far if this truly were another game against Akron, but this sure seemed to be pouring salt on Pitt’s wounds in their house. Franklin was giving his backup players a chance to shine on the field and challenging a play he felt would benefit one of those players. But that won’t stop many from criticizing Franklin when he was coaching his team to the last whistle. Doing so sends a message to the team that he won’t quit on a game and will take nothing for granted. After Penn State neatly coughed one up in the season opener in Week 1, that message may have been needed for Penn State. But at what point should a coach let up off the gas pedal with some of these decisions? Should those be altered when in a rivalry game? James Franklin is challenging a fumble call, up 45, with 60 seconds left. And don't be out here complaining that Penn State shouldn't be passing this late in a blowout. Pat Narduzzi and James Franklin don't like each other. Narduzzi has done his fair share of prodding. They're going to antagonize each other any way they can. Don't like it? Stop it. This tweet pretty much sums up Franklin’s image. James Franklin is that coach you love if he’s yours but hate if he’s not. Arizona State might be the Pac-12’s best playoff hope. If UCF and Boise State go undefeated, both should be in the playoff discussion. USC should fire Clay Helton. It was another particularly strong weekend for the top Group of Five contenders. Boise State and UCF didn’t have stuff challenges, but they easily took care of business without having much to be worried about at all. The American Athletic Conference had another batch of highs and lows in Week 2 as well. Going 2-0 against the ACC with USF beating Georgia Tech and East Carolina blowing out UNC (yeah, that really happened) was big for the conference. Houston picked up a dominant win over the Pac-12’s Arizona to help the AAC out too, but SMU getting beaten by 30 at home by TCU, UConn getting trucked by Boise State 62-7 and Temple dropping a second straight home game leveled the bar just a slight bit. The Mountain West had some good wins for the conference too with Colorado State beating Arkansas and Boise State doing Boise State things. But elsewhere around the conference? Meh. Air Force lost to FAU and Fresno State lost to Minnesota. For now, the AAC has the edge over the Mountain West, top to bottom and in terms of quality wins in my mind. But it’s still anybody’s game for that lucrative New Year’s Six bowl spot. Another week in the books and I still see no reason to doubt some of the expected playoff contenders coming into the season. Alabama, Georgia, Oklahoma, and Ohio State all had blowout victories, and Clemson pulled out a tough road win as well. And other potential playoff candidates like Auburn and Penn State had good showings when all was said and done this weekend as well. Yeah, that’s right. Three SEC teams sitting in my top four. But don’t worry. Stuff like that will sort itself out in due time. But Auburn still has what I believe to be the best profile win with their opener against Washington. Georgia stormed their way up my pecking order with a blowout of South Carolina on the road. Meanwhile, Alabama stays firmly in my top four and I’m keeping Oklahoma in right now too. I dropped Notre Dame to make room for Georgia. If that’s how I have the top four now, has my projection for the playoff changed yet? No, not quite. Although, I will alter the ordering just slightly. I’m still keeping Penn State in as my last team in after I regained some confidence in them with their blowout at Pitt. And I’m nudging Alabama just ahead of Clemson. Bryce Love got back on track in a nice win for Stanford over USC. Kentucky fans flipped the same car over twice while celebrating their win over Florida. It was awesome seeing Nebraska and Colorado again. Even better it was a classic ending. Liberty had their punter ejected for targetting. I do like SMU’s turnover gimmick. Navy beat Memphis in a pivotal AAC win. This run by Navy quarterback Malcolm Perry is worth a few watches. Iowa State vs. Oklahoma: Rare revenge game for the Sooners, who have been firing on all cylinders to start the year. North Carolina vs. UCF: After getting blown away by East Carolina, the Tar Heels now prepare for explosive Knights. This could turn ugly on Chapel Hill. Toledo vs. Miami: Hurricanes traveling to one of the MAC’s best? Consider a possible upset alert. Auburn vs. LSU: A pivotal SEC West showdown already? You bet. NC State vs. West Virginia: Mountaineers playing their second power conference opponent in non-conference play, once again away from Morgantown. Ole Miss vs. Alabama: Any thought of an upset bid by the Rebels vanished on Saturday. TCU vs. Ohio State: Last game for Buckeyes without Urban Meyer. This one’s being played in Jerry World in Arlington. Texas vs. USC: Not what it should be at this point in time, but a big game for each regardless. Utah vs. Washington: An important Pac-12 contest that could end up being a Pac-12 championship game preview. Worth staying up late for.